Differences faded when a group of African health care leaders, visiting Madison as part of the Mandela Washington Fellowship for Young African Leaders, sat down this summer to talk about HIV/AIDS challenges with their University of Wisconsin-Madison counterparts. Sharing a table in the UW-Madison Health Science Learning Center, they realized the issues they face with HIV/AIDS know no boundaries. Physicians, nurses, midwives and social workers from Kenya, Lesotho, Nigeria, ­­­Botswana, Uganda and Wisconsin recognized each other’s questions. What do you do when a patient has taken so many pills for so long that she refuses to take any more? When do you tell a child who was born with the virus that he is HIV-positive? Stigma is alive and well everywhere: How do you help patients know who to tell and when to remain silent? 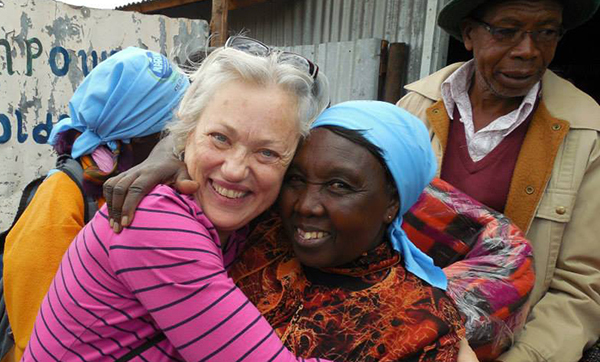 Susan Mmalane works with volunteers and HIV-positive patients in a Botswana refugee camp. claim the same rate of success—measured by the number of patients whose HIV is enough under control that no virus can be detected. About 30 percent of U.S. patients reach that zero viral load; about 30 percent of African patients reach the goal. “We are practicing in a different way, but, at the end of the day, we have the same goal,” says Susan Mmalane, an HIV/AIDS prevention and care officer for the Botswana Red Cross Society in Dukwi Refugee Camp. “We’re looking to an HIV-free future.” Of the 2,600 refugees who came from across Africa, 10 percent are children who fled war zones, many of them arriving alone. 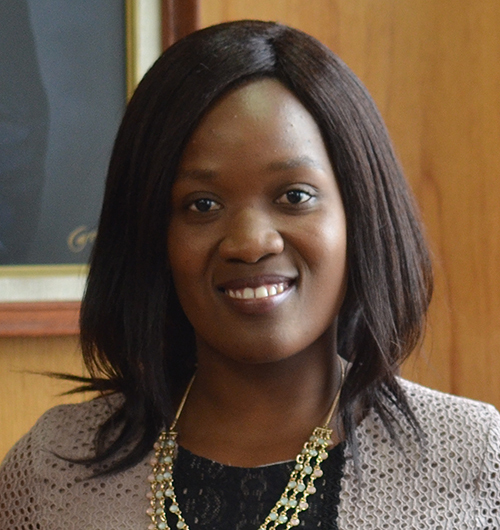 Mmalane supervises volunteers, counsel patients and works with an HIV support group. She would like to establish an HIV/AIDS club for the children living with the virus, so they can give each other hope. UW Health’s Susan Gold, left, a long-time global health field course leader, established Talking Health Out Loud, a mobile health platform that gives teens a safe place to ask questions about HIV and sexuality. “We tend to think we’d be so much better,” says Susan Gold, a UW Health HIV nurse who has worked in and led UW-Madison global health field courses to east Africa since 2003. “But (the results are) about the same because there are so many barriers to care all over the world. 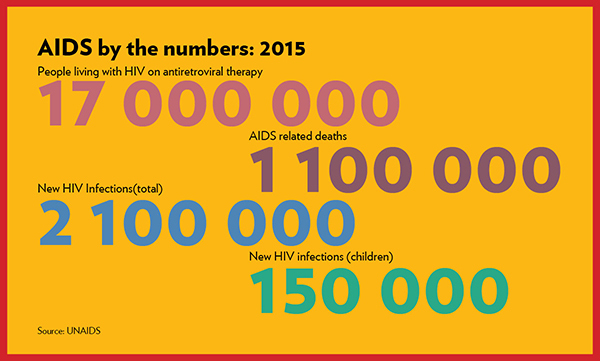 It doesn’t matter what country you live in, HIV has huge effects, economically, politically, socially. We’re all in this together. (The meeting) was an affirmation that the fight goes on.” Gold also founded Talking Health Out Loud, a mobile platform that gives teens a safe place to ask questions about HIV and sexuality. The HIV/AIDS meeting brought together Africans and Wisconsinites who are on the front lines of prevention and care. It was the sort of intimate, personal discussion that can only take place when participants are in the same room sharing the same concerns. 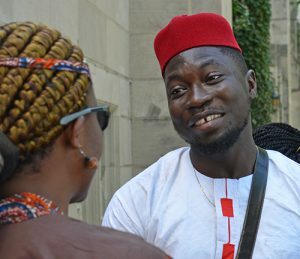 The African health leaders were among 25 scholars who spent six weeks in Madison in summer 2016 as part of the larger, national program sponsored by the U.S. Department of State. The Mandela Washington Fellowship for Young African Leaders is the flagship program of the Young African Leaders Initiative. The UW African Studies Program hosted the scholars, and the Global Health Institute organized several academic sessions for them, covering climate change and health, quality improvement, immunizations, designing cities for the future and HIV/AIDS. “There’s so much we can learn from people who do similar work to what we do, and who do it in resource limited areas,” says James Conway, a UW physician specializing in pediatric infectious disease who organized the meeting. He’s also the UW-Madison Global Health Institute associate director of health sciences and has worked around the world to improve access to vaccinations. “As things get tighter in the United States, we realize we need to be more efficient,” Conway says. “One of the most efficient things you can see is how people manage health challenges in resource-challenged settings. Bringing people together so they see their challenges are the same makes them more likely to work together. Sitting together as they did in Madison lets them break down what needs to be done and share how they are taking those steps. Femi Adebola helped found HiDoctor-Nigeria, a mobile platform that provides free access to health information and medical consultation. 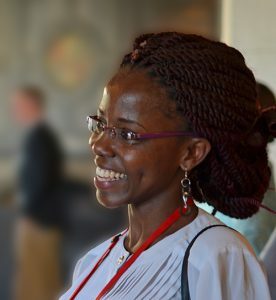 Sicily Mburu founded AIDS No More to get HIV/AIDS information to teens and young people through social media. @AIDSnomore to get information to teens and young people through social media. With more than 1 million HIV cases in the country and a surge of teens and children born with the virus, she struggles with how soon to let children know they have HIV. She also engages with young HIV-positive moms on how to breastfeed and safely wean their babies. Posted in Education, Health Systems, News, News - Home, Our People. Our Projects.